This super easy recipe is wonderfully versatile, and we recommend you cook a double batch and freeze half for later in the week. Or, you can serve it in lettuce cups one night, then use the leftovers on top of noodles or rice the following night! You can also adapt it to your taste: feel free to add bamboo shoots, water chestnuts, zucchini or carrots… prefer chicken or turkey mince to pork mince? Go ahead and swap it! That’s why we love it. It’s also full of protein and the ginger is great for maintaining good digestive health and circulation! Place lettuce leaves in a bowl of water into fridge while you cook everything else. Place optional rice noodles in a pot, cover with boiling water, place the lid on and leave to cook for 5 minutes, before straining and rinsing noodles. Heat up oil in a pan or wok. Add garlic, ginger, mince and vegetables and cook for 1 minute before adding tamari, oyster sauce and optional chilli. Cook until meat is just cooked through and vegetables are tender. Stir through optional rice noodles here. Remove leaves from water and drain. 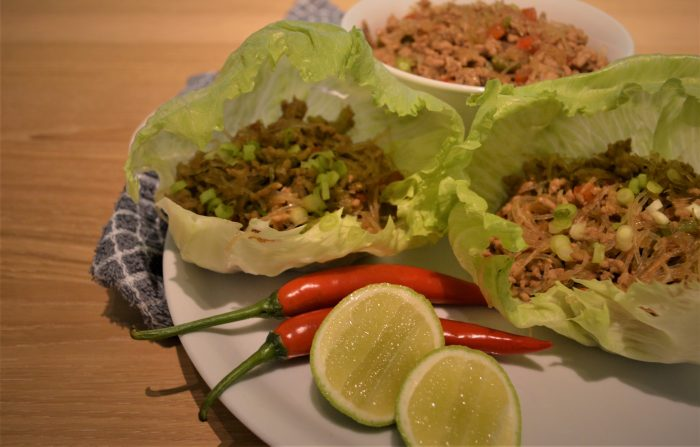 Serve mince in iceberg lettuce leaves, sprinkled with spring onion and a squeeze of lime.